Agreed. But as these games go on, they'll all get more comfortable. It comes down to Elliott a bit as well. I didn't think he was horrible, he got beaten by some world class scorers, but when he batons down the hatches a little I think the D will relax and play their game even a little better. Not Philly or A-Train though, they were great. I'm sure I wasn't the only one thinking that we NEED to re-sign Volchenkov after than game. Diddle the regular season, it's all about the playoffs. 4.2 X 3, I'm in A-Train, stay with Phillips for gosh sake! Oh man! That's too funny. I was wondering. Do you live close to that house? I really hope he can get it together, and I believe that he can. He came here because he wanted to win, I think he'll try much harder next game. He needs to hit more for sure, that will be a big factor for us too. He can't be scared to take penalties. If he does end up taking some, we need to kill off those opportunities. So far the ones he's been called for have been pretty crappy, if that happens we have to kill it. And, we are capable of killing penalties, so it should be cool. Just be Sutton, you know? No. The first I heard of it was from you right now. 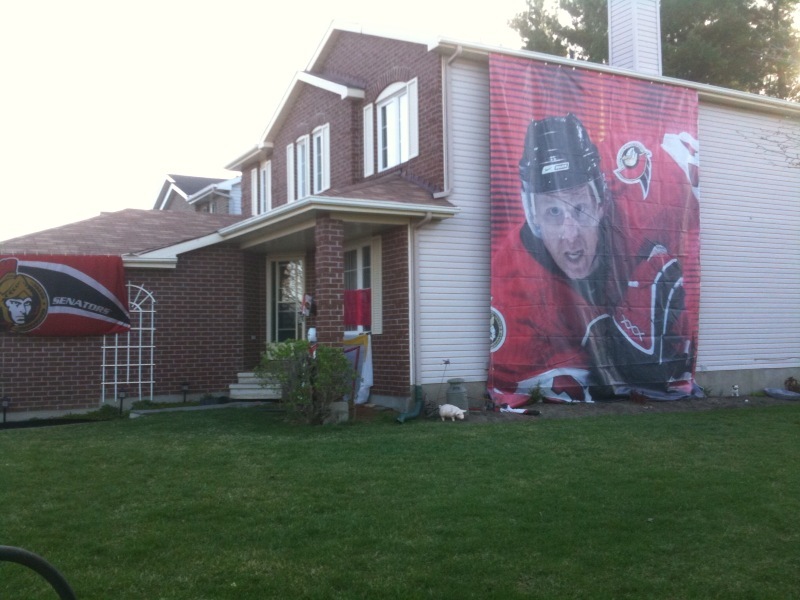 I didn't even know there was a house with a huge banner on it until you mentioned it. Maybe as simply as Home Depot, or Home Hardware or the like, or a nautical store like The Chandlery in Ottawa. I got my flag at the sports store at Herongate Mall. Wow, that's impressive. Them some die hard fans. Even that little flag puts mine to shame. I need to get me one of those. And that LARGE one looks like it came off the arena. 79 Re: GAME 2 - 2010 Stanley Cup GAME DAY: Ottawa Senators @ Pittsburgh Penguins, Friday Apr. 16, 2010 - 7:00PM EST.